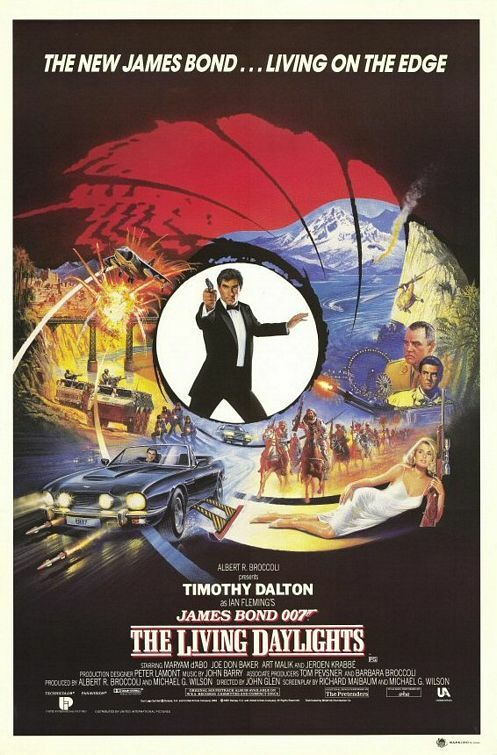 Twenty-seven years ago, on 31 July 1987, James Bond returned to the screen in The Living Daylights, with Timothy Dalton as the new Bond. The film has a notable departure in the style of music, as composer John Barry decided that the film needed a new sound to match this reinvented Bond, and his love interest — a musician with dangerous ties. To celebrate the anniversary, here is a brief extract from The Music of James Bond by Jon Burlingame. In the script, Bond is caught up in a complex plot involving high-ranking Soviet intelligence officer Koskov (Jeroen Krabbe) who is supposedly defecting to the West. Koskov’s girlfriend, Czech cellist Kara Milovy (Maryam d’Abo), is duped into helping him escape his KGB guards. A Greek terrorist named Necros (Andreas Wisniewski) then supervises his “abduction” from England and transport to the Tangiers estate of an American arms dealer (Joe Don Baker). Eventually Bond and Kara find themselves at a Soviet airbase in Afghanistan, where they meet a Mujahidin leader (Art Malik) who helps 007 thwart the plot. Because the early portions of the story take place in Czechoslovakia and Austria, The Living Daylights crew shot for two weeks in Vienna, including all of the scenes where Kara is performing on her cello. Director John Glen recalled conferring with Barry about the classical music that would be heard in the film. “We listened to various pieces before we chose what we were going to use,” Glen said. “Obviously we needed something where the cello was featured strongly.” (They ended up with Mozart, Borodin, Strauss, Dvořák and Tchaikovsky.) They recorded the classical selections with Gert Meditz conducting the Austrian Youth Orchestra and then filmed the ensemble, using the prerecorded music as playback on the set. Maryam d’Abo was filmed “playing” the cello during several of these scenes. “I started taking private lessons a month prior to the film,” she recalled. “I just learned the movements. They basically soaped the bow so there wasn’t any sound [from the instrument]. It was hard work; I could have done with a couple more weeks of lessons. They demanded a lot of strength. No wonder cellists start when they are eight years old.” The solo parts heard in the film were played by Austrian cellist Stefan Kropfitsch. Jon Burlingame is the author of The Music of James Bond, now out in paperback with a new chapter on Skyfall. He is one of the nation’s leading writers on the subject of music for film and television. He writes regularly for Daily Variety and teaches film-music history at the University of Southern California. His other work has included three previous books on film and TV music; articles for other publications including The New York Times, Los Angeles Times, The Washington Post, and Premiere and Emmy magazines; and producing radio specials for Los Angeles classical station KUSC.